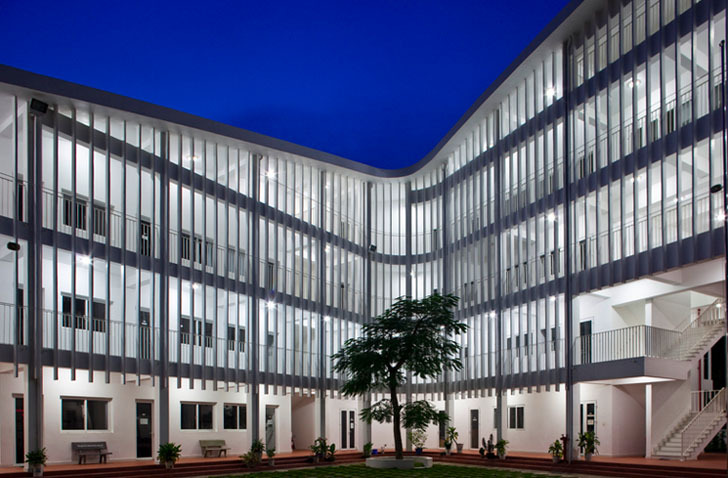 Students at the <a href="http://www.archdaily.com/199688/binh-duong-school-vo-trong-nghia/" target="_blank">Binh Duong School</a> designed by <a href="http://www.votrongnghia.com/" target="_blank">Vo Trong Nghia</a> will not be hunkering down into dusty old classrooms this season. 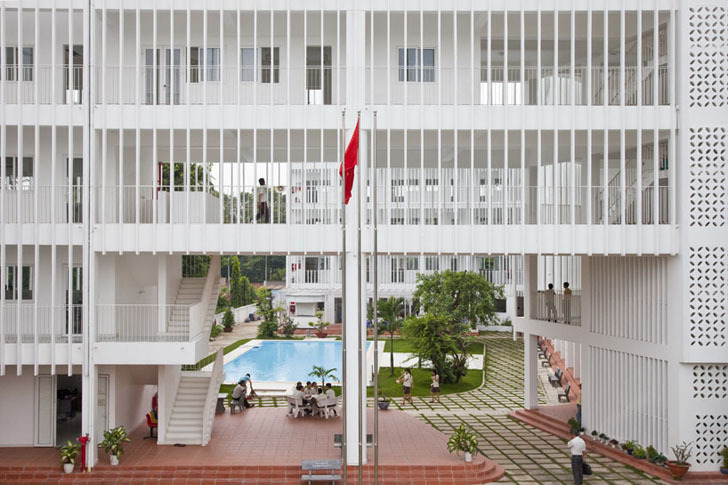 The enormous junior high school sits in the middle of a lush forest outside<a href="http://en.wikipedia.org/wiki/Ho_Chi_Minh" target="_blank"> Ho Chi Minh</a>, acting as an open, breathable hub for nearly 800 students. Its unique concrete <a href="https://inhabitat.com/postojna-concert-hall-boasts-the-world%E2%80%99s-first-post-office-inside-a-cave/postojna-cave-concert-hall-studio-stratum-5/" target="_blank">S-shape</a> design resembles a vine not unlike those surrounding the structure. The green-roofed building appears to grow out of the ground at one end, then curves around <a href="http://en.wikipedia.org/wiki/Courtyard" target="_blank">courtyards </a>and public spaces. 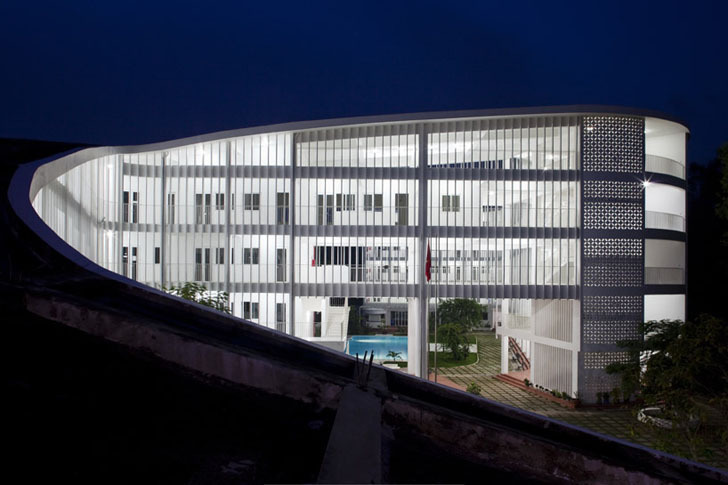 Designed with the intense tropical climate of <a href="http://en.wikipedia.org/wiki/Vietnam" target="_blank">Vietnam</a> in mind, the school blurs the lines between indoor and outdoor, providing plenty of shade and open ventilation for students to learn and enjoy their surroundings at the same time. 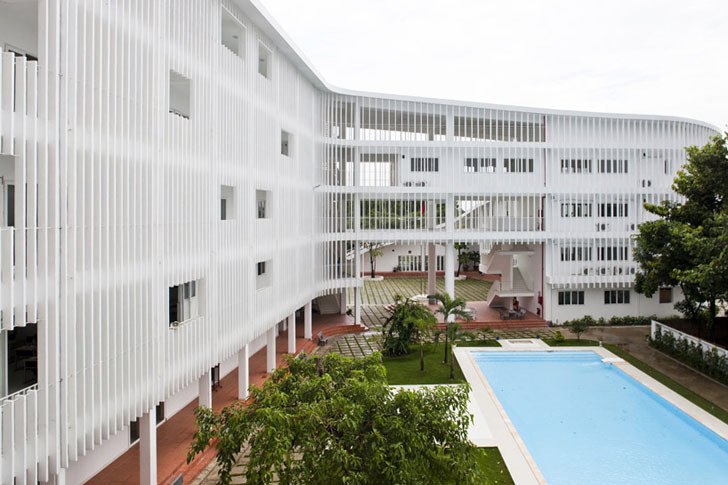 The school's design is five storeys high, aligning itself with the height of the surrounding forest. White <a href="http://en.wikipedia.org/wiki/Precast_concrete" target="_blank">precast concrete</a> is situated into rows of <a href="http://en.wikipedia.org/wiki/Louver" target="_blank">louvers</a>that act as shading panels for the outdoor hallways. 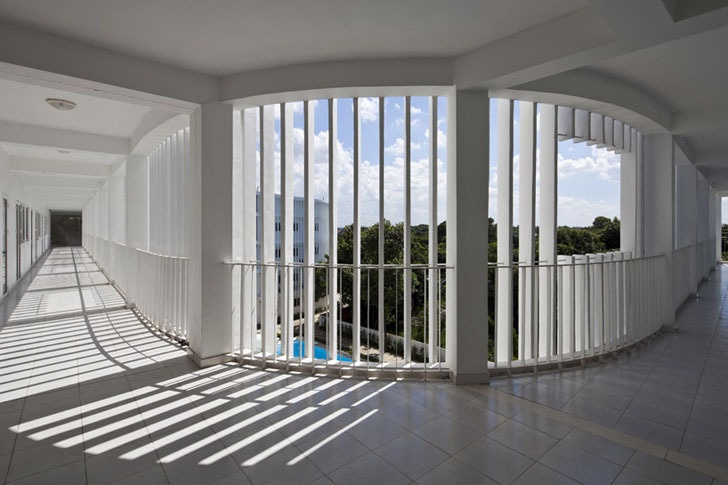 The concrete panelling also allows for <a href="http://en.wikipedia.org/wiki/Passive_cooling" target="_blank">passive cooling</a> and protection from the elements during Vietnam's <a href="http://www.vietnamembassy.org.uk/climate.html" target="_blank">rainy season</a>. The S-shaped building winds around two courtyards. One yard is for public events, announcements, and performances. 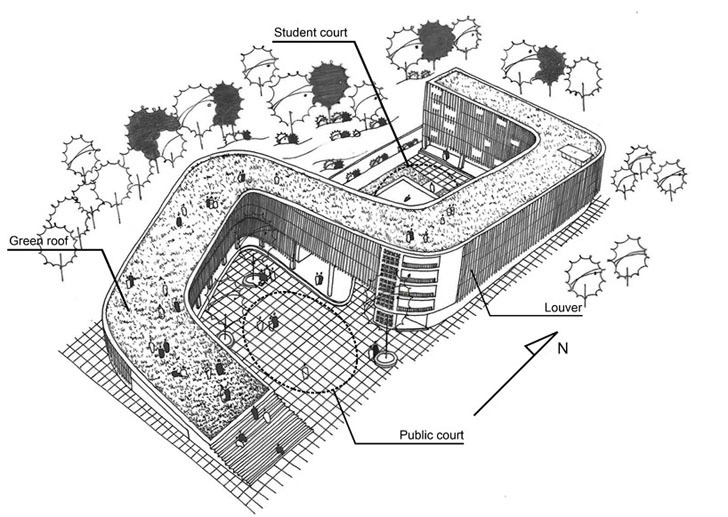 The other courtyard is tucked away near the back of the building for students to privately study or enjoy leisure activities.
. Stairs begin on the ground floor outside the building's far end and ascend toward the <a href="http://en.wikipedia.org/wiki/Green_roof" target="_blank">green roof</a> that sprawls across the entire design. The grassy area is open for student activities, outdoor classes, gardening, and also acts as an insulation system, keeping the floors below nice and cool! 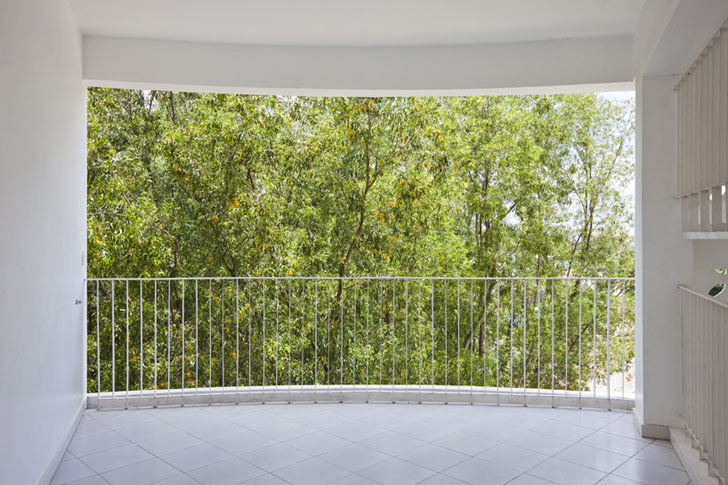 The building's open structure allows it to be part of its surroundings without harming the nearby forest. tudents can interact with and learn about the <a href="https://inhabitat.com/environmental-documentaries-bring-a-green-theme-to-2011-academy-awards/" target="_blank">environment </a>while attending to their daily studies. 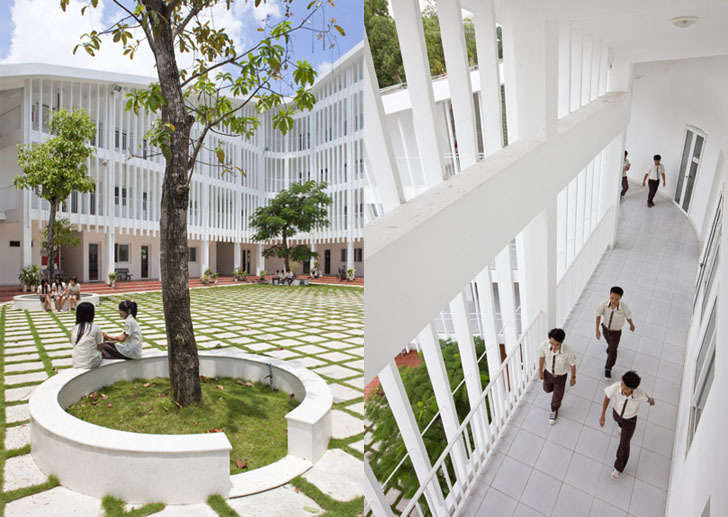 The school's continuous structure acts as a safe campus that flows from classroom to courtyard, allowing students to move freely throughout the space, inside and out. 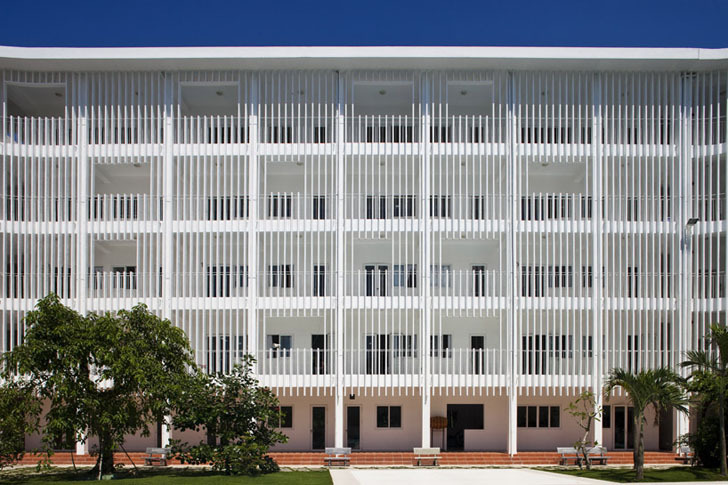 Students at the Binh Duong School designed by Vo Trong Nghia will not be hunkering down into dusty old classrooms this season. 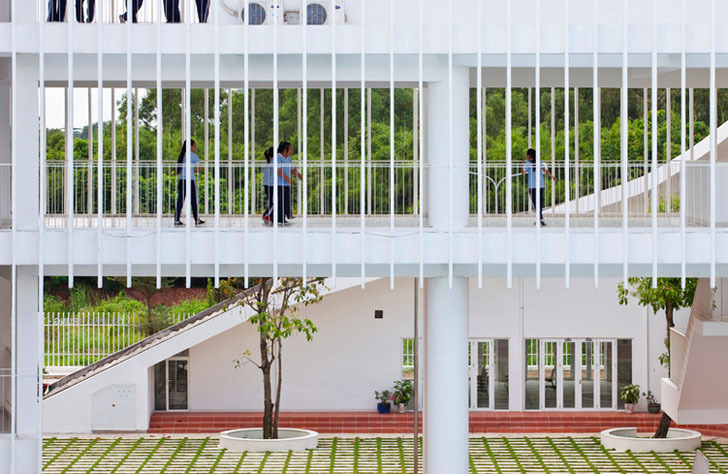 The enormous junior high school sits in the middle of a lush forest outside Ho Chi Minh, acting as an open, breathable hub for nearly 800 students. Its unique concrete S-shape design resembles a vine not unlike those surrounding the structure. The green-roofed building appears to grow out of the ground at one end, then curves around courtyards and public spaces. 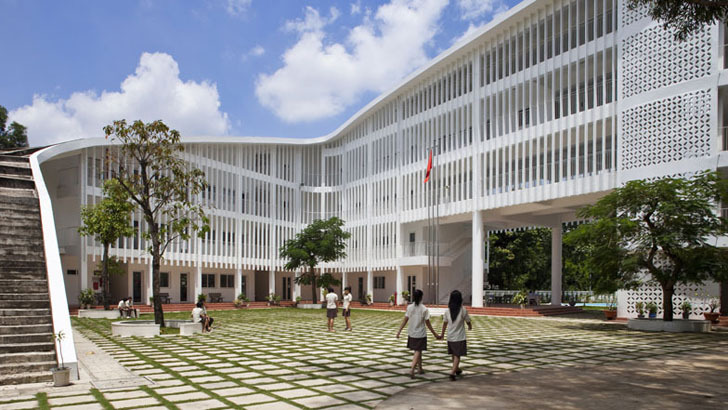 Designed with the intense tropical climate of Vietnam in mind, the school blurs the lines between indoor and outdoor, providing plenty of shade and open ventilation for students to learn and enjoy their surroundings at the same time.